Abu is a Shavadai living on planet Simarka. On Simarka, Colonel Jack O'Neill is looking at a young teenager with binoculars running from four big dogs chasing him. The young boy, Abu, calls for help as one of the dogs bites him on the calf. O'Neill uses is sidearm to make the dogs running away, and frees Abu. Abu introduces himself to SG-1 and asks them if they are from the Sea of Ogada. O'Neill doesn't say no. When Captain Samantha Carter arrives to say the dogs are gone, Abu is chocked and asks if she's a woman. When Carter approaches Abu, the latter turns his face, stating he cannot look at her. 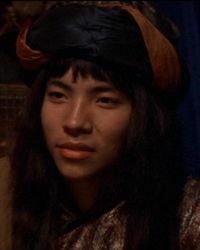 When people of his tribe arrive to them, he urges SG-1 to take her back to their country. When his fellow villagers and Moughal, Abu's father, threaten to kill Carter because she spoke, Abu confront them, and tell them she saved his life. Later, inside Moughal's tent, Abu tells he's making some medicine drugs with powerful healing effects. He takes O'Neill, Daniel Jackson and Teal'c, leaving Carter with local outfits. He shows a wound caused by a fire arrow on a young villager. This man doesn't fill any pain. During the night, Abu kidnaps Carter. The next morning, he explains to her that she will be sold. They approched a village, led by Turghan, a feared and powerful chieftain. Abu hopes exchanging Carter for Nya, Turghan's daughter, the love of his life. Turghan refuses the deal, and Abu has to accept 300 weights of gold as a deal. He leaves Turghan but is able to tell Nya to flee in the woods with him. Abu comes back to Moughal, O'Neill, Daniel and Teal'c who went in search of Carter to free her. Scared, he tells them they will stone to death Nya because she disobeid to the law. Abu asks SG-1 to use their weapons to free her. Moughal says that Abu is suffuring the same "madness" he was; he is in love of Nya as Moughal was in love of his own wife. Back in Turghan's village, Moughal and Abu ask Turghan to stop the killing processing and to accept the challenge according the ancestral laws, challenge which can be held only with a chieftain. Turghan doesn't want to challenge Moughal who is a crippled man. Carter volonteers to challenge him instead. The two of them fight and Carter wins, freeing the Shavadai, Nya, and Carter. Just before SG-1 leaves, Abu is preparing his wedding with Nya, a six day long wedding. Abu in Kathleen Ritter's Lexicon. This page was last edited on 21 November 2014, at 13:01.